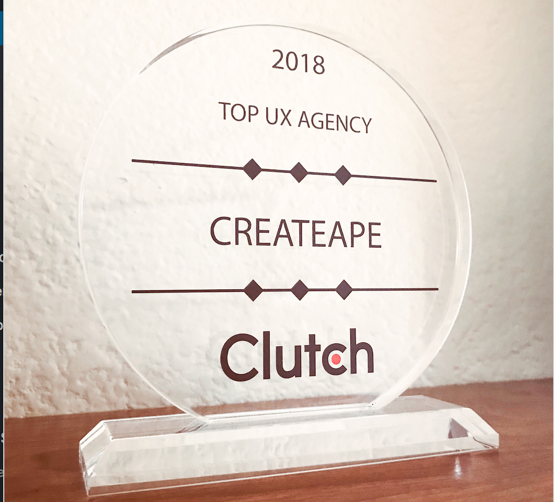 Clutch released a list of the top UX agencies across the United States and CreateApe was honored to be among them as the #1 UX/UI agency in Orange County! Rock on, team! Clutch is a B2B firm in located in Washington DC, connecting small to medium businesses to agencies and consultants through research, ratings, and reviews. Clutch covers over 500 different industries, each company evaluated on criteria such as market presence, client base, and industry experience. CreateApe was ranked one of the top agencies in Orange County for our User Experience & User Interface (UX/UI) design expertise and consistent ability to provide the highest quality of customer service possible. 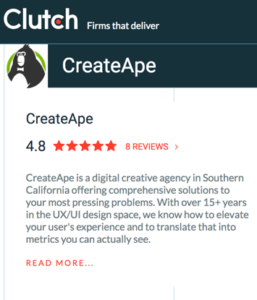 Thanks to all of our outstanding clients taking the time to do the Clutch interview process, CreateApe now has a rating of 4.8, making us the matrix leader in the Orange County UX Designers page organically. “The top UX designers use best practices to optimize a website’s usability, accessibility and overall look,” said Heine. The top agencies in the U.S. have been chosen based on client feedback, verified through phone interviews, quality of work and market presence. At CreateApe, we tackle every project no matter the level of complexity with a sense of purposeful passion because we value our clients success as our own. We develop modern, visually appealing products that aren’t only designed to look good, but are functional and intuitive to the User’s experience. But we would be nothing without happy clients. Their feedback to Clutch has been more rewarding than anything else could have been. Thank you to our awesome clients!